E3 2017 proper started pretty darn well for me. Soon after the doors opened at the Los Angeles Convention Center and the crowd outside started to flood south hall, I touched down at Warner Bros’ booth to check out the sequel to one of my favorite releases of the past few years, Middle-Earth: Shadow of War. During my two-hour long appointment, which was comprised of an in-depth presentation and a hands-on demo, it was clear that Monolith isn’t kidding around. 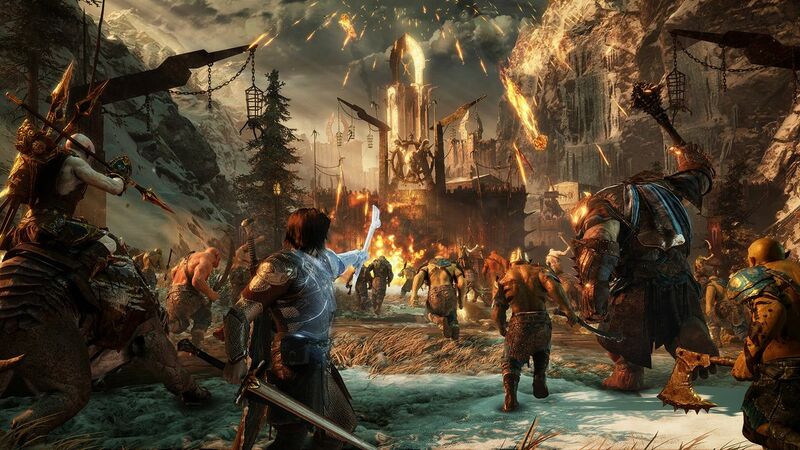 Shadow of War is by no means an appendix to the Lord of the Rings’ videogame legacy. It feels much bigger and crazier than Shadow of Mordor in just about every regard. Everything I got to see made it clear that Monolith had a goal in mind: to expand on what made Shadow of Mordor so great, its Nemesis System. Since its release, no other release has come close to mimicking the feel of having a living, breathing conflict with enemies that constantly evolve based on your actions. Shadow of War takes that system and just goes nuts. Now, not only capture enemy orcs and turn them to your side, but also have them fight for you in big battles, putting them together in armies to help you take over enemy strongholds. By taking (or not) into account every one of your units’ strengths and weaknesses, as well as your enemy’s – depending on the info that you gather on them by interrogating ‘worms’, a mechanic already seen in Mordor – a battle can go your way with few losses, or end in failure, further boosting the morale of your foes. There’s also host of upgrades you spend a set amount of points acquiring, like a handful troll attack unit options and weapon coating like poison and fire, which were widely used during the presentation. After you reach victory, you’re able to pick an orc from your army and promote him to warchief and top your ranks. As for the world this new entry takes place in, I was very impressed by its scale. Considering that the demo was a condensed version of what the final build is bound to offer, lots of activities happened to take place within a close distance to each other, but in relative terms to what anyone who’s played an open world title, it was still large, with objectives sometimes taking over a kilometer to get to. Skills like the shadow elf step and vaulting came in extremely handy, and helped me get from one point to the other with relative ease. Much like in Mordor, it’s quite easy to go all Assassin’s Creed and scale pretty much any wall, a bit that helped me escape out of a few of the many hairy situations I managed to get into. See, it had been a while since I’ve played Shadow of Mordor, so very little in the way of how it’s supposed to be played was fresh in my mind. That made me miss practically every opportunity that the rep who played it during the presentation excelled at exploiting. I sucked really bad. With the exception of some weirdly merciful orcs who had a clear shot at taking me out after my health was drained and didn’t, allowing me to escape, I was positively the worst bearer a power ring could ever have chosen, in every regard. Even so, I had a great time playing around with all the tools at my disposal. There’s just so many options to keep track of in terms of abilities too, which proved to be overwhelming for me to demo fully in my allotted time. Out of the five or so skill trees within the character upgrade options, I stuck with what helped me the most with stealth, and with the limited amount of points I had in hand, I invested in trying get some of the cooler sneaky business that went on during the presentation, stuff like instant executions while sneaking and a faster meter when taking over enemies for my army. Even then, I stumbled when trying to take over a stronghold, which awarded me with much deserved teasing from the opposition. That eventually led me to try and complete a few of the other mission types offered in the demo, one in particular proved to be potentially interesting lore-wise: a stroll through a cursed wood filled with orcs that had been taken over by a mysterious plant entity who I eventually ran into and had to fight with. Little to no context was given in terms of story throughout the entirety of my time with the Shadow of War, so there wasn’t much that I gathered from watching any of the cutscenes. Again, that’s something that shouldn’t be a problem after the actual release, but for the demo, there was little in the way of helping me understand what was going on, outside of the overall objective which was noted on screen. The original went far in stretching out the Lord of the Rings fiction to suit it to its needs – even though it overdid it a little too much, like bringing poor Gollum out of his hole in a way that would have J.R.R. Tolkien choke on his pipe. 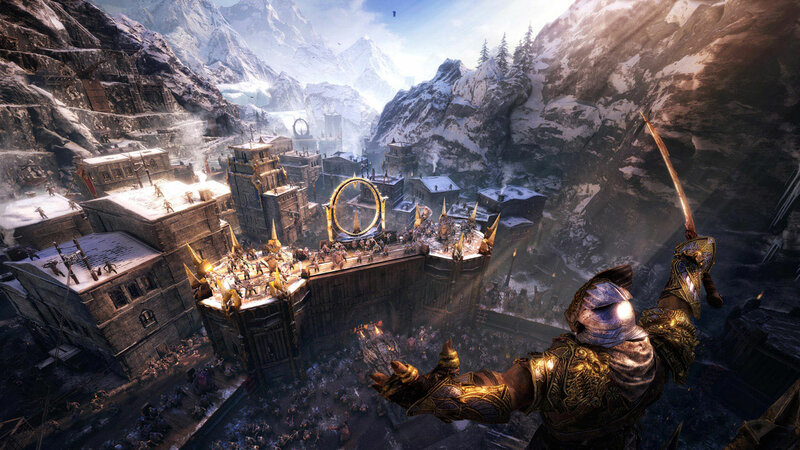 In that regard, Shadow of War‘s in a much more comfortable position of having all of the exposition of its premise out of the way. There’s tons of potential just as to where Talion and his elf lord spirit buddy Celebrimbor’s adventure will take them. Chances are high that Monolith and Warner Bros will nail it. Middle-Earth: Shadow of War will be out on October 10th for PC, PlayStation 4 and Xbox One.